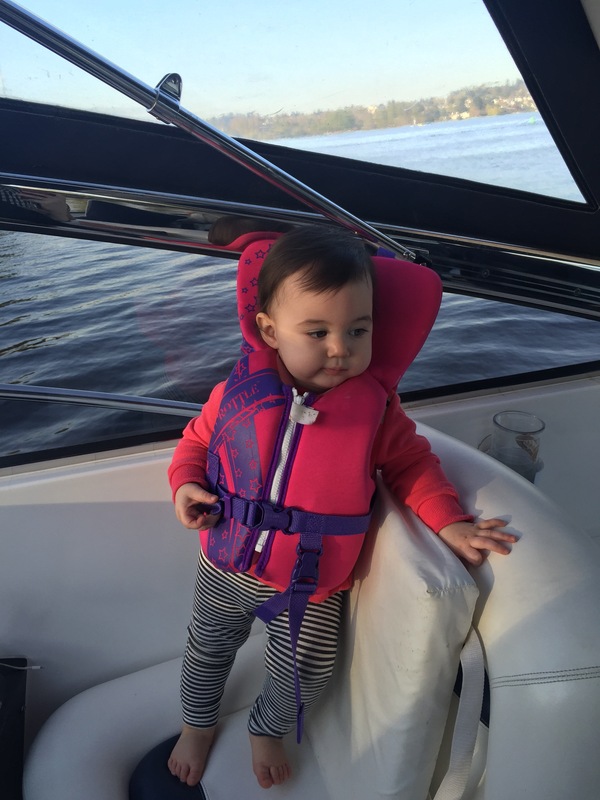 Baby Boating Safety – Abbey Co.
By now, I am sure you all know that I am not only a mommy, but a boater! As much as I love to have fun on the water, I am totally ‘captain safety’, and understand all the dangers that come along with boating too. Naturally, after working in the marine industry for almost 5 years I have heard all the boating stories that are out there… some as fun as it gets, and others completely terrifying. If there is only ONE safety tip I can instill in you is that all babies and young children should WEAR A LIFE JACKET when on a boat AT ALL TIMES. Child is too small to stand? THEY STILL MUST WEAR A LIFE JACKET. Children have plenty of adult supervision? DOES NOT MATTER, LIFE JACKETS. Experienced boaters? KIDS IN LIFE JACKETS. No matter what the scenario, absolutely every child should be in a life jacket regardless. To some people this sounds absolutely silly. They think what ever would a 3 month old baby need a life jacket for… babies don’t move anywhere and I am holding them the whole time! However, if you were to suddenly caught by bad weather there is potential for an emergency to happen faster than a life jacket could be found and put on a child. 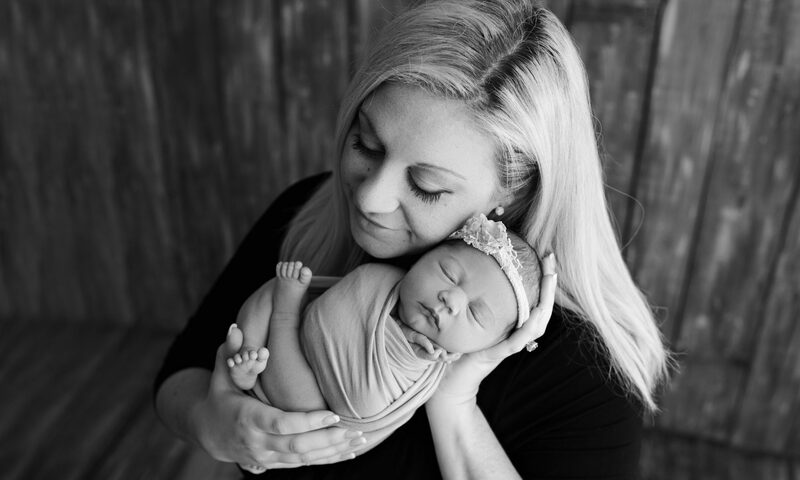 Though every parent’s reaction always would be to save their baby first, a big wave is all it takes to loose your grip on baby and terrible things can happen from there. Boat accidents happen. It is much better to be prepared just in case. Besides, it is the law! In Washington State, all children 12 years and under are legally obligated to wear a life jacket while boating. So, in addition to keeping your kids safe, you are avoiding a hefty ticket by having them take this simple step. The only important detail of this safety precaution is that you also make sure your child is wearing the appropriate size and style of life jacket. 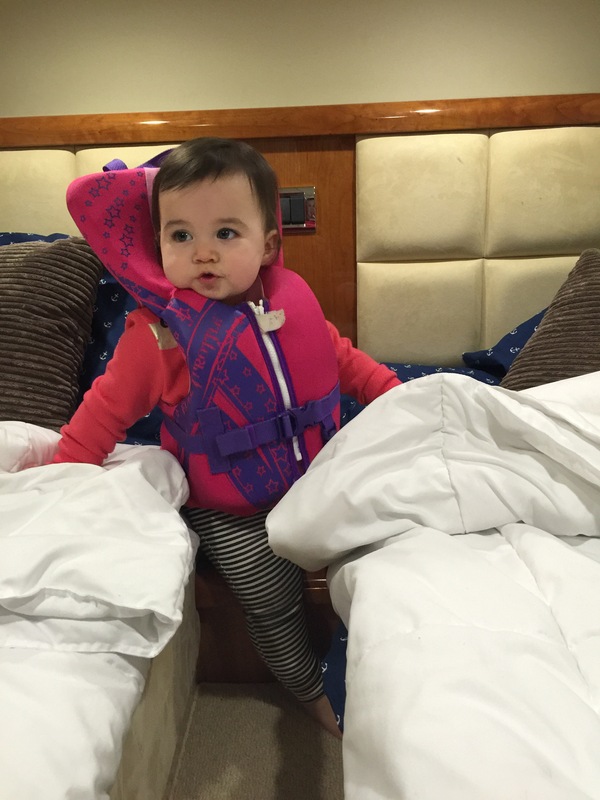 All life jackets (just like car seats) have weight ratings. You should be able to look on the inside of the life jacket exactly where a normal shirt tag would be to see the weight rating of the jacket. For infants, it is especially important that there is a neck support on the back of the jacket, and also a buckle that goes between their legs to insure the child does not slide out. Both those features can be seen in these pictures I posted of my daughter boating, approx 16 mos. old. Are you not sure where to find boating gear? AMAZON has free 2-day shipping for Prime members! If you prefer to go in-person you can find Fisheries Supply in Fremont, and West Marine in both the Interbay area of Seattle and Bellevue. Life jacket isn’t stopping her from having any fun! She is so adorable! where do you keep your boat? Which lake are you on? Thank you! I sell boats for a living so I am very lucky that I get to pick from our inventory when I go boating 😊This boat is my boss’ Sunseeker 35 Portofino that we have taken a few trips on. I work on Lake Washington in south Bellevue, just across from Mercer Island. I am always boating on Lake Washington or Lake Union and we usually go out into the sound a few times a year. Cobalt and Malibu are the brands we sell and what I usually take out! That is the most stinkin’ cute baby! I can’t believe a person who wouldn’t put a life jacket on their baby! My uncle has a boat and I remember we had to wear life jackets until we were 13, and even now we aren’t allowed in the open water without at least a pool noodle! Safety first, people! Very helpful post! BF co-owns a boat and the co-owners just welcomed a little one. Oh fun! 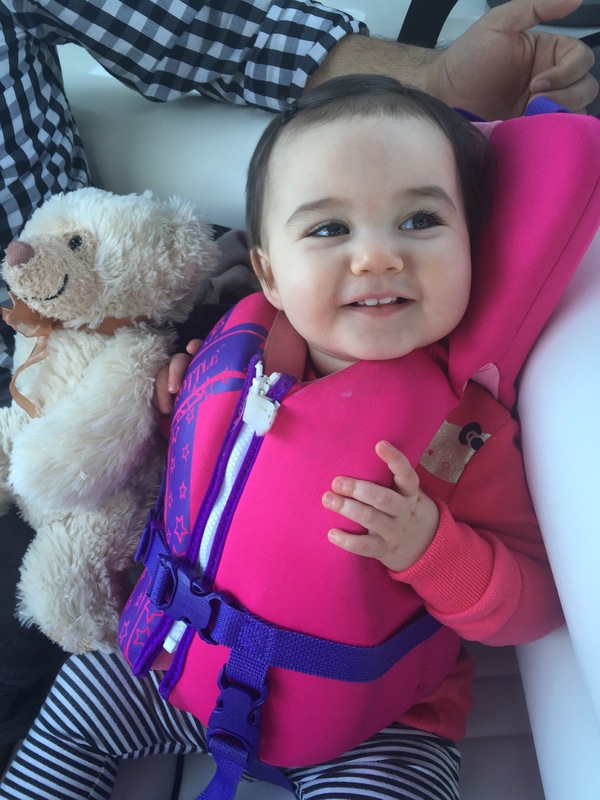 My daughter went for her first boat trip when she as only 8 weeks old so she is a water lover now! Oh my gosh! This is one of the cutest posts I have seen. Your daughter is so cute. She looks sooo happy. Did she enjoy the adventure? This is too cute. 😂 She’s going to grow up loving the water, adventure and the outdoors. Pingback: Kirkland Uncorked – The Basics and Why You Should Attend – Abbey Co. Previous PostPrevious 5 Simple Tips To Make Your Cooking Exponentially Better!